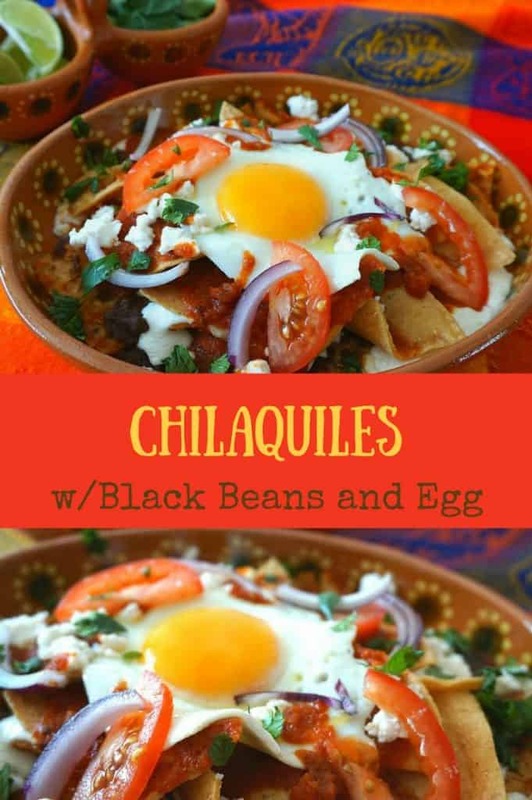 When I first heard about Mexican Chilaquiles, I wasn’t so sure about them. 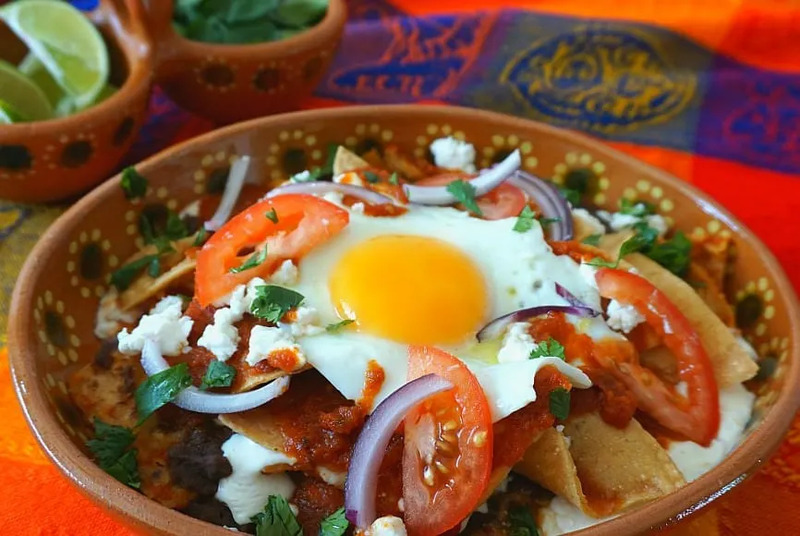 A breakfast food made with tortilla chips and eggs, like breakfast nachos, could be either amazing or a complete disaster. As it turns out, they are delicious and are now one of my favorite brunch dishes. The tortilla chips become slightly softened by heating them in a green or red enchilada sauce (or a combination of the two). 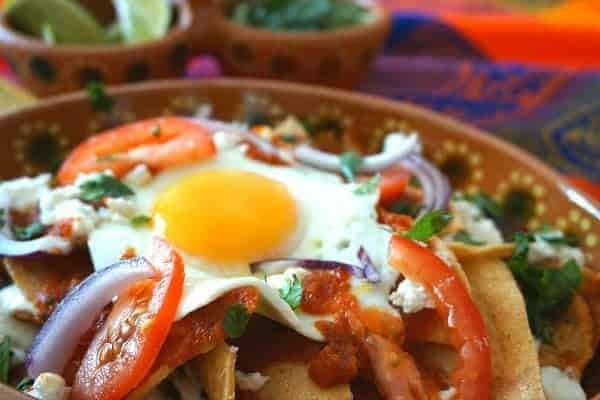 In this version the chilaquiles are finished with black beans, cheese and fried eggs and then topped with fresh cilantro, tomatoes and red onions. Another common topping is shredded chicken or beef. They are fantastic for brunch or even a weekday dinner. If you’re looking for other brunch recipe ideas, try this related Sunrise Quesadilla recipe make with bacon and fontina cheese. Feel free to visit our food finds/recipes section to view our full collection of recipes inspired by our travels around the world. We also have a resources section where we give our best travel tips that we’ve compiled after 2+ years of full-time travel (and counting!). Place refried bean in a sauce pan over medium heat. Add cumin powder and bring to a boil. Add 1/4 cup of water in order to thin them slightly and then cover and reduce heat to a simmer. Heat the enchilada sauce in a frying pan over medium heat. In the mean time, prepare 2 sunny-side-up eggs. Add the tortilla chips to the enchilada sauce making sure they are all evenly coated. Layer 1/2 of the tortilla chips to the bottom of a serving dish. Top with the black beans and jack/cheddar cheese. Add another layer of tortilla chips and top with the slices of tomato, onion and chopped cilantro. 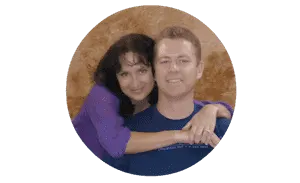 Considering a visit to Mexico? See these related articles that just might inspire you to get traveling! Please come make me breakfast!